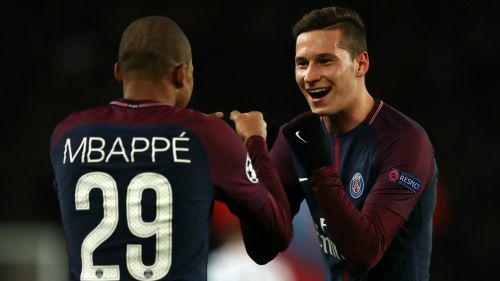 Julian Draxler admits Paris Saint-Germain team-mate Kylian Mbappe is unlike any player he has seen before. World Cup-winner Mbappe has established himself as one of the world's finest young footballers during the past three seasons with PSG and Monaco. The 19-year-old has already scored four goals in just three Ligue 1 appearances in 2018-19, having formed a formidable attacking partnership with Edinson Cavani and Neymar. And Draxler says the teenager and Brazil star Neymar are the best two players he has played with in his career. "Despite his age, he has a huge presence in the pitch," Draxler told Sport1. "He demands the ball and orchestrates the play. I have not seen anything like it before. Alongside Neymar, he is already the best player I played with." The form of PSG's front three has limited Draxler to just 32 minutes of league football this season, but the Germany international is determined to fight for his place under Thomas Tuchel. "The situation in Paris is very ambitious and the competition is high, especially in my position," he said. "I can't stay in my comfort zone but must prove myself in training. "In the end, I hope Thomas Tuchel is convinced by me. In a technical way, he is a very good coach. He jokes around, the training sessions are diverse, and he demands a lot. You should not try and go into training with only 80 per cent. He realises that immediately and gets tough." Who has the brighter future - Kylian Mbappe or Ousmane Dembele?